Your customers love self-service for easy transactions like purchases, checking balances, and making payments, which happen 2–5 times more than other contacts with your company. Customers expect to be able to resolve most issues digitally, and if you don’t have a self-service option for easy tasks, they could grump about having to call. 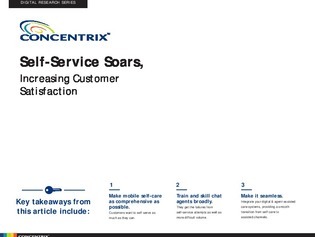 In this guide, learn how your organization can do self-service the right way by giving customer the quick and easy resolution they expect.